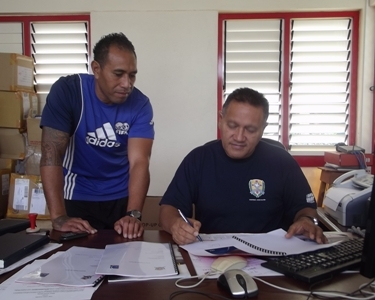 Signed by TFA Secretary General, Mr. Lui ‘Aho, the Tonga Research Funding Agreement marks another step towards reality of hosting and piloting of Football driven universal health care program. Mr. ‘Aho said TFA is happy with the progress. “We are in a position that we feel that we are ready to steer this very important project and I’m so happy with all the development so far.” ‘Aho said. The proposed FIFA’s “11 for Health” program will be launched in the Kingdom in July following its first introduction to Tonga in March, by FIFA’s Chief Medical Officer and Chairman of FIFA’s Medical Assessment & Research Committee, Professor Jiri Dvorak MD. To be marked as a good start,“11for Health” was then warmly welcomed and most recently earlier this month, Tonga’s Minister for Education, Hon. Dr. ‘Ana Taufe’ulungaki accepted the proposals and gave the green light signal for the project to be practiced in High School level. In the meantime Mr. Pau Likiliki, the National Project Leader considers the agreement as another step towards reality for “11 for Health” in Tonga. “This is the main significant component needed to run this project and I’m glad that both parties, TFA and FIFA has agree on it and it’s a huge makeover.” Likiliki said. The program will be piloted among 2232 students ages of 11 & 12 years old from 15 selected schools across the main island of Tongatapu. Mr. Likiliki, who is also TFA’s Social Responsibility Officer and Just Play Project Manager, also highlights the next move. “Now we await the arrival of the fund and gears before moving on to stage phase one, which is hosting a weeklong workshop for the instructors. Each school will provide two tutors to come and learn about “11 for Health” and also getting to know how to run and manage it in their respective schools.” Likiliki said. Meanwhile, Ministry of Health has shown its support through its National Committee for Non Communicable Disease. The Ministry believes that “11 for Health” will play an important role in its campaign of promoting healthy lifestyle as Tonga is fighting its most vulnerable life threatening health problem of obesity and diabetes. 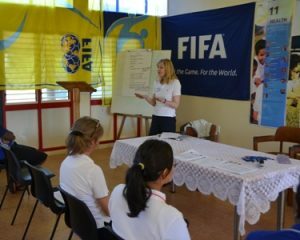 “11 for Health” is a FIFA initiative that uses the Sport of Football as a tool for enhancing and improving children’s knowledge, attitudes and behavior towards diseases and prevention, through 11 simple messages. Tonga High School, Tonga College, Vaini GMS, Kolomotu’a GMS, Talafo’ou GMS, Lotolu GMS, Houma GMS, Kolovai GMS, Talafo’ou GMS, Ocean of Light International, Tailulu College, Apifo’ou College, St. Andrews High School, Beulah College, Takuilau College. Next PostTFA's "TonFoot" radio show to go on-air. “11 for Health” workshop a closes in high colors. 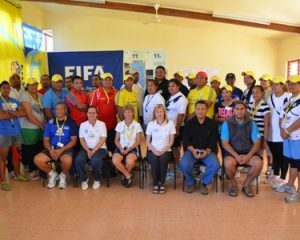 FIFA’s “11 for Health” shaping up in Tonga. TFA's "TonFoot" radio show to go on-air.